Chavez Warns of War... Says Colombia Is "Israel of South America!" Chavez Warns of War… Says Colombia Is "Israel of South America!" Colombia announced Saturday that a top FARC leader along with 15 other rebels were killed in combat in the southern provinces. FARC second in command Raul Reyes was killed in the raid. Hugo Chavez was very upset over this attack on FARC. 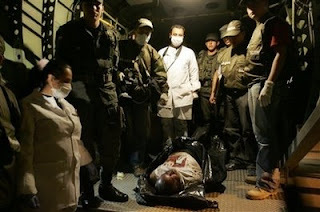 Raul Reyes was decribed as being the most severe military blow to the FARC terrorists ever. Hugo Chavez is moving troops to the Colombian border after Colombian troops killed top level FARC terrorists yesterday. President Hugo Chavez on Sunday ordered thousands of troops to the border with Colombia after Colombia’s military killed a top rebel leader. Chavez told his defense minister: “Move 10 battalions for me to the border with Colombia, immediately.” He also ordered the Venezuelan Embassy in Colombia closed and said all embassy personnel would be withdrawn. The announcements by Venezuela’s leftist leader pushed relations to their tensest point of his nine-year presidency, and Chavez warned that Colombia could spark a war in South America. Chavez called Colombian President Alvaro Uribe “a criminal,” and branded his government a “terrorist state,” likening it to Israel for its U.S.-backed attacks on militants. Chavez closed the Bogota Embassy after the terrorist deaths yesterday. Let’s hope Hugo cut back on his coca leaves for awhile. 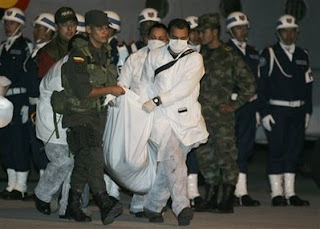 The body of FARC leader Raul Reyes was flown back to Bogota after the clashes. Hmm… Don’t you think it is about time that US democrats started to support the Colombian Government and quit denying assistance to America’s South American ally?